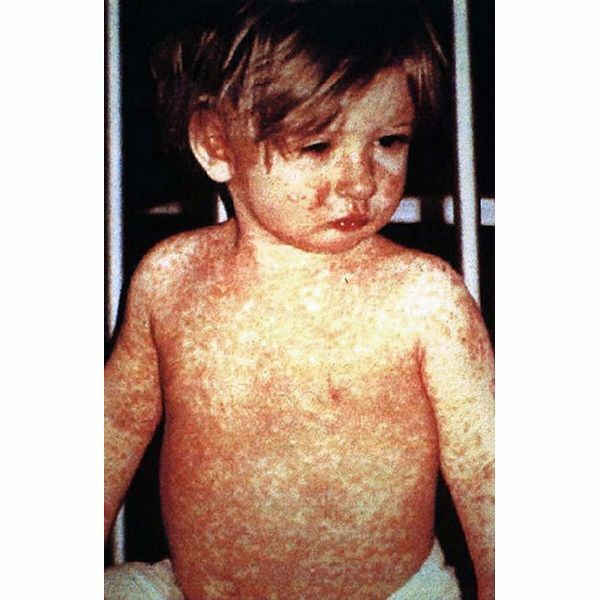 Measles (also called rubeola) is an infectious disease caused by a virus. It occurs mostly during early childhood, when resistance to infectious agents may still be low. Measles in children was once a common illness but is now relatively rare in the U.S. because of the measles vaccine. If not immunized, it is still possible for your child to become infected. It is highly contagious and can be passed on to others through air and direct contact. Measles in children first start out with a mild to moderate fever. After 24 hours, symptoms include a runny nose, cough, red eyes, a higher fever, and small white spots inside of the cheeks, called Koplik spots (not often seen because they only stay a short time). In about 3-4 days after the initial symptoms, a rash (which usually doesn't itch) appears on the face and gradually spreads downward. • Encourage bedrest and quiet activity, especially during the early stages. Isolate your child from others who may be at risk until the fifth day of rash. • Keep a cool-mist vaporizer in your child's room to help prevent breathing difficulties. • Give your child plenty of fluids, such as water, electrolyte replacement beverages (like Gatoraid), and juices (particularly orange and lemon) because a high fever and sweating can cause dehydration. • Encourage soft bland foods. • Give a sponge bath when your child's fever is high. Have your child sit in a bathtub with partially filled water (lukewarm) and gently sponge water over his or her neck and shoulders. • Another treatment for measles in children is keeping their eyes clean. Flush your child's eyes with a plain saline solution (available at drugstores). Using an eyedropper, put a few drops in the corner of each eye. If the eyes are crusty, wet a cotton ball with saline and gently wipe the eye, from the inside corner to the outside (use a different cotton ball when wiping the other eye). You may also want to dim the light in their room because their eyes can be sensitive to light.